Dr. Michael Plotkin grew up in Rockaway Beach, NY, and has lived in central NY since 1989. After earning a BS in biology from the State University at Albany, he worked in biology research before pursuing a career in veterinary medicine. He received his DVM from Cornell University in 1993. 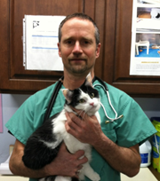 His experience includes practice in small animal medicine, mixed animal practice, and emergency/critical care medicine and surgery. Dr. Plotkin has been a part of the SOS team since 2010, and is excited to be part of the effort to end animal overpopulation and advance shelter medicine. He is married and owns 4 cats and 2 dogs. His other interests include cross-country skiing, playing banjo, gardening, home improvement, and the sport of Ultimate.